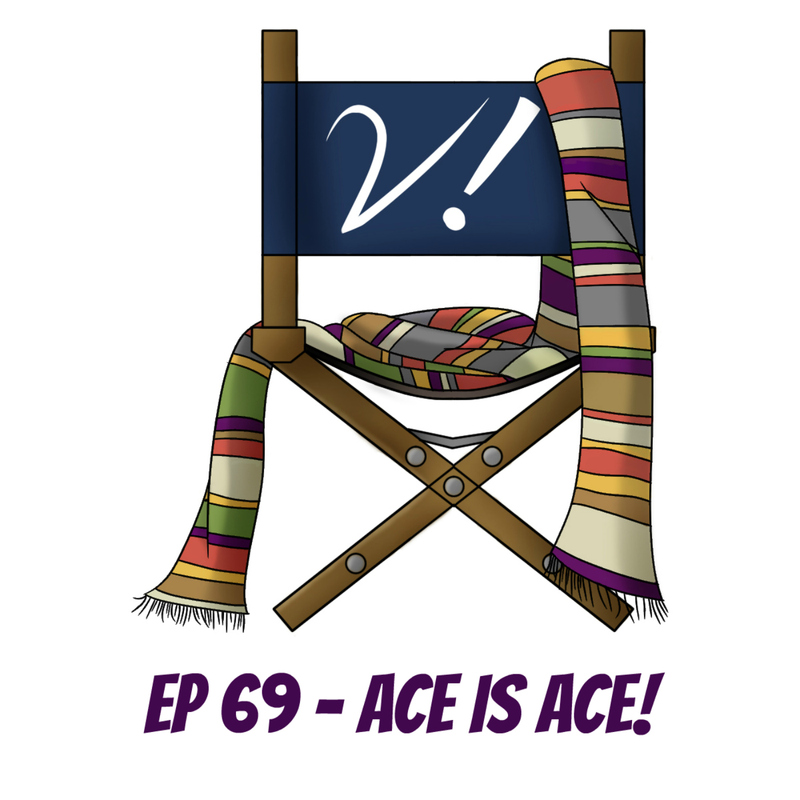 Ep 69 – Ace is Ace! This week we focus on one companion–the winner of our Verity! companions poll! Join Deb, Erika, Liz, and Lynne, as we talk about Ace! Our personal feelings about Ace as a companion are mixed, but we all agree (mostly) on her importance as a companion. It’s pretty easy to draw a line between Ace and Rose, and we do just that! We also chat a lot about Ace: as compared to other women on screen at the time, as a character to identify with (or not), and as a tuxedo-wearer. What are your feelings about Ace? Do you love her attitude? Or does she put you off as a viewer? Or something in between? Let us know in the comments! listening to Doctor Who The Writers’ Room! learning Missy is returning to Doctor Who! seeing/signing Companion Piece in the wild! Frazer Hines tweeting that she did a great interview–with emoji! signing four copies of Companion Piece, including one for a Doctor Who writer! appearing in another Doctor Who essay anthology (available for preorder now): Outside In 2! Lynne is thrilled Paul Cornell will be writing for Titan’s DW comics! adores a Doctor/Master fanvid set to Taylor Swift’s “Blank Space”! listens to the awesome Gallifrey Public Radio podcast! coos over the upcoming Doctor Who Funko Pop Vinyls! A small amount of feline paranoia here. That miaowing, was it actually in my earphones? Or was it because I’ve just been outside shovelling cat poo from the garden? I think Ace’s character arc in the TV show played a major part in keeping the DW flame alive during the wilderness years, and it must’ve helped the fans’ cause that the final classic companion actress has always had that fangirl vibe about her. I believe Sophie Aldred was right on board with script editor Cartmel’s use of the 2000ad comic strip “Halo Jones” as a model for the feel of DW in the late 1980s. Ace’s starting point of being played so young, and especially her use of language, just felt irritating & juvenile to me. Calling the Doctor “Professor” was more disrespectful than endearing. The use of “Ace!” was cringeworthy enough, but her other catchphrase brought even worse memories of a supremely naff kids’ show, “It’s Wicked!” which was broadcast Saturday mornings on BBC1 in 1987, probably a few months before Ace’s first TV appearance. Yes, “It’s Wicked!” is available to watch on YouTube, but… just, no, don’t. Was the angry side of Ace an issue for me? Given the choice of kickass heroine or cute sidekick, I’d always choose the latter. Gabrielle was always my favourite Xena character, and I missed a whole load of eps from that show after what happened to Gabby in season 3. I’m amazed that it’s only 16 days til the 20th anniversary of Xena’s first appearance on Hercules. Today saw the launch of 2000ad’s 38th birthday issue. Double-breasted suits are now so old, they’re right back on trend. As is Ace. And cats are cool too. Just thought I’d add that. Just in case. I’m pretty sure Marie Cat (who cohabitates with Lynne) was trying to say hi, so that’s probably the meowing you heard. 🙂 Though there are several other Verity!Cats, so I can’t be sure. Ah, right, thank you. I was shovelling poo whilst listening to Verity on my earphones, kept having to look over my shoulder, make sure I wasn’t about to get pounced on. Also forgot to say: I gave up reading DW novels in the mid-1980s in favour of the proper grownup adult SF by people like William Gibson. Imagine the delicious irony when I recently downloaded Ben Aaronovitch’s 1989 novel of “Remembrance of the Daleks” and discovered, right at the start of Chapter One, Ace’s tape deck is manufactured by Ono-Sendai, the (fictional) Japanese corporation that made the VR decks in William Gibson’s cyberspace trilogy. Doctor Who books and proper grownup adult SF. Not mutually exclusive reading material after all. Lesson learned. Oops, that 2000ad comic strip “Ace Trucking Co.” was actually by Alan GRANT (and John Wagner). Alan Moore created “Halo Jones,” as mentioned in the Cartmel Master Plan feature, DWM issue 475, August 2014. I thought it was Deb’s cat. Given that Deb mentioned said kitty earlier in the episode! It was Marie Cat. I have tried EVERYTHING to keep her quiet during recording, but clearly she was disappointed that we weren’t talking about Survival enough. Just starting this and am so excited. Ace is definitely one of my favorites, especially because when she came on the scene, I was a rebellious punk teenaged girl about the same age (as the character, not Sophie) and it was SO awesome to see someone like me on the show (well, she was way more badass than I was, of course, as I was a shy introvert, but you know what I mean). P.S. Oh, and the tomboyish, queerish bits of the character certainly helped with me identifying with her as well. I loved Ace too, and I’ve always figured I was *supposed* to – I was 13 in 1987 and thrilled to have someone like her on the show. It made it seem that much more real that the Doctor might come for me when life got too hard, if he would take on Ace, why not me? And I also loved Sylvester McCoy for not being Colin Baker’s Doctor, as I’d really struggled with the violent/nasty/unstable Doctor. Any Ace fan should read the New adventures book “Set Piece” by Kate Orman. Sophie Aldred wrote the foreword and it is an excellent novel primarily focused on Ace. It was one of the first New Adventures novels I started with so can be read without knowing anything about the range. Reasonably cheap on eBay. Excellent episode! It was great to hear a spectrum of opinions on Ace that weren’t tainted by the old critique that because she was played by an older actress who was doing make-believe lower class acting she wasn’t any good. Watching her run as a 16 year old Australian lad on first release this didn’t bother me in the slightest. The intent was clear, and she was exciting and refreshing after Mel’s more pantomime approach. Some of the dialogue points were a bit naff (Wicked! as noted above) but it wasn’t a problem. Ace was feisty and interesting and felt like a real person. The character arc was a bonus – but I really didn’t buy the seduction scene in Fenric. To answer a question raised on the podcast, as an Aussie we get enough British TV to instantly appreciate where Ace was supposed to come from, but not so that we are bothered by lack of authenticity. We are not as blind to nuance of accent as the north Americans! But I did appreciate Liz’s robust comments on the diversity of Mr Moffat’s companions compared to RTD’s. Like the rest of the panel I registered Rose, Martha and Donna as more diverse representation than Amy and Clara. Side note: watching Tegan was always an interesting experience. I have trouble pinpointing why. Her accent was certainly Australian, although it was tweaked a little (very clear t’s. Most Australians would say ‘Auny Vanessa’, whereas Tegan’s ‘Aunty’ was crystal clear). It’s also I think because our accent really stands out when surrounded by a group of people all speaking BBC English. My cultural cringe-o-meter goes ping! Finally: thanks for the recommendation of Gallifrey Public Radio! That is a great listen. Oh, and Erika, if this was the one where you were having skype nightmares, then it totally didn’t show. Great editing! Ok Deb. I’m doing as I am told. Pausing the podcast and watching the video you liked with the Master….. This Rose was inspired by Ace thing: obviously I can see the argument, and don’t deny that it is at least in part true. But always the problem with Rose for me was precisely that she wasn’t inspired by Ace enough. Ace (and in face all of the McCoy era) is about the disaffected, the ones who don’t fit in. Rose, for all her working class credentials, is unashamedly fashionable and cool. You don’t get any impression she had trouble fitting in or was unpopular. What’s more, that particular trendy working class look and lifestyle is heralded as a kind of virtue by the show during her era. I can’t place the episode off the top of my head, but I’m comvinced there’s a scene with 10 and Rose sharing a joke at the expense of someone who’s a bit goth. Whatever it was that actually happened, there was something about the dynamic between the two of them that made me really really uncomfortable- could this be the same guy who stood there in Survival, Greatest Show and Happiness Patrol as the champion of the misfits? Yes, it is partly about how keenly the show embraced popular culture, which was always going to be partly for marketing reasons, whereas the 80s show has become a fringe show and so moved to embrace that element, but it’s why for me, in many ways, Ace and Rose are polar opposites. You could imagine standing back to back with Ace against the world when growing up, I imagine Rose would be too busy hanging out with the cool kids, being terribly nice, but always with her eye for someone better. Ace is desperately lonely and desperate. She has one real friend and does not find the company of others easy. Yes, she, like Rose, is always talking to others, but without any of that easy confidence. And when Ace does that seduction thing in Fenric, it’s a big deal. Rose is constantly being chatted up, is obviously confident in her own body and in her relations with others. Ace hides inside her coat and tries to ignore that bit of herself. It was partly that that feels so revolutionary about her. Rose, by contrast, almost embodies more of the characteristics of the earlier companions – pretty, easy going girl with an added bit of 21st “sass” for good measure. She’s the kind of person one might aspire to be whereas, particular as a teenager, but it remains relevant for anyone socially awkward, Ace feels like the sort of person one actually is. And Ace is frightened. She’s bloody terrified. Great points! Thanks for commenting. And I don’t think you’re alone in having difficulty expressing how important you feel Ace is. She really resonated with a large swathe of fandom. Great counter-argument about the whole Ace-Rose comparison. Perhaps the only equivalent “outsider” companion in NewWho so far is actually Donna, who’s “failed” at conventional adulthood. I’m so glad I could introduce you to something new! There really aren’t enough words to describe how much joy this video has brought me this past week. Thank you both for creating it! It has definitely been added to my Top Ten of All Time list. My thanks as well for the link, Deb. I just watched it, and I could feel the grin on my face get bigger and bigger, until I found myself giggling out loud. It was truly great. Made me all warm inside. I hadn’t seen any Ace stories so prior to listening to the podcast I watched The Curse of Fenric in preparation and I have to say, of the four or five classic Who stories I’ve watched I enjoyed this one the most. Even to a New Who fan like me, who has limited knowledge of the classic series, your podcast was very accessible and enjoyable. Thanks! I’m so pleased that it worked for you! I always try to be aware that we have listeners who aren’t as well versed in Classic Who and want them to feel like they’re welcome to party just as much as the Oldest of Old Who fans. Just a heads up, next week will be far ranging but expect lots of mentions of Liz Shaw and Zoe. Note: That’s not next week, but the week after. Next week is a fun (if disjointed–thanks Skype) Verity! Extra! This really came perfectly. I’d just finished up the two Web of Queers episodes about lesbians and bisexuals in Doctor Who and they touched a lot on Ace. It’s fun to hear discussions touching on different aspects of her. I really love Ace. Mostly through the audio and the books but I’m exited for watching her episodes (I’ll come to that eventually, I have a spreadsheet…). I’ve always strongly identified with women who doesn’t fit into the typical feminine role. I’m a latecomer to Doctor Who but I wish I’d seen her when I was a kid, it’s not like there was a lot of representation of that type of character around then. From my childhood I mostly remember latching on to George from the Famous Five, otherwise only identifying with male characters and not female ones. Her queerishness would have helped me come to terms with myself more as well. Finally. What stories did Liz say have stolen a lot from Ian M. Banks? I totally missed that. The story that Liz was talking about was one of the New Adventures novels, “The Also People”, which is basically set in something as close to the Culture as the publisher’s legal department felt safe letting them go — but with the very important addition of characters that are actually fun to spend time with. It’s got a tongue-in-cheek dedication at the front pointing out that Doctor Who has a long and noble tradition of borrowing plot ideas and settings from other SF franchises and forgetting to give them back. I’m not sure I love any of the New Who companions the way I loved Ace. I was in my early to mid-teens and I wasn’t one of the popular girls – and I liked stuff like SF and science and Doctor Who… So for me, Ace was the perfect companion for my teenage years. I wonder how much the age of the viewer (especially if female) when they first saw Ace has an impact on how much they love her. Even though Lynne was a little older than I was when she first encountered Ace, she seems to have identified with her as strongly as I did. I’m wondering if, say 15-25 years old are the core ‘Ace years’! I also wonder just how much I would identify with Ace now I’m 40. I haven’t re watched very much Classic Who – i enjoyed what I saw at the time, but I really struggle watching old TV, since TV has changed so much in even the last 10-15 years, let alone the last 25-30 years (I’m not even able to consider going back as far as 50 years…). I’m a dedicated New Who fan now. Which brings me to the Ace led to Rose idea – I’m not sure on this one. I see some similarities, but I feel Ace was more complicated and interesting a character than Rose – but how much is that nostalgia for my teenage hero? If I’d been 15 when New Who started, Rose would probably have been my idol. But I don’t feel she is that different from women on other TV shows in the 2000s in the way that Ace felt so strikingly different in the late 1980s. Whew. It seems that I too had a lot to say about the importance of Ace! Thanks Verities and other commenters for lots to think about. Great ep, as always, and hopefully a sign of how these companion discussions will go this year. I think one of the key things about Ace for fans of a certain age (cough, late 40s-50s now), that was briefly touched on towards the end, was how she was developed in the novels. While Liz has a point that, looking back on them collectively, they don’t quite accomplish what they set out to do, one could say that about every era of Doctor Who. For those of us older, who were actually in our late 10s through early 30s in the first half of the 1990s, and who held the flame for DW through the 80s and mourned its loss, the novels were, effectively, new Doctor Who of that moment. They were read and discussed online as vociferously and quickly as any new episodes that have aired since the show came back. This era was the flowering of the Seventh Doctor and his companions: Ace, Benny, Roz, and Chris (with a cameo or two from some older friends). Many of us saw the ongoing saga in the novels as a logical continuation of what was already bubbling in the series since Dragonfire. This was for better AND for worse, as the “dark Doctor” thread made for many intriguing stories, but got a bit predictable and a bit convoluted as the novels wore on. Yes, the quality was often variable, but the ones that got it right, got it SO right. Anything by Paul Cornell, Kate Orman, or Lance Parkin. Most of Steve Lyons, Andrew Cartmel, and David McIntee. So when I look back on Ace, I still always see her (and hear her, in the audios) through the filter of the novels. I first encountered her via Sophie Aldred on TV in 1988 and 89, but to me, the character, and the Seventh Doctor, for that matter, will always primarily be the one I read from 1991-95. Wait, you mean they didn’t set out to create interesting, layered characters that you wanted to get to know better, and then kill them? Hunh. I read the first 50 or so through a friend, then kind of gave up. Too many, too much $$, too much the same. Except, as you say, Paul Cornell and Kate Orman. They were great. I agree with Derek’s comments above. The quality of the NAs was indeed variable and reading them could often be frustrating. On the basis of the NAs published, I really think that 1992 was one of the strongest years in all of Doctor Who, and that 1993 was one of the weakest (Kate Orman’s Left-Handed Hummingbird book is great though!). Thumbs up also from me to Paul Cornell and Kate Orman, but personally I also loved Warhead, Transit and The Also People. By the way, I thought that Liz’s summary on 80s fandom’s attitudes was absolutely spot on. Oi! I was 16 in 1990 and I’m only 40 now! Watch your maths! Ace was an interesting character back in the day. But to me she wasn’t a forerunner of Rose. If Rose is like any character its Jo Grant. More naieve than she admits, romantic at heart, a bit of a fashion victim at times and more practical than she’s given credit for. TV Ace is more of a forerunner of Amy – sassy and, if in doubt, aggressive. I have to qualify my comments in that I’m a tv-purist-fan, and I didn’t engage in the idolisation of Ace in the books, audios and other secondary fluff.